Today's painting occurred just before a little snack. Guess what I snacked on. Yes, some juicy grapes. The painting is a tiny 4x6 oil painting on canvas. 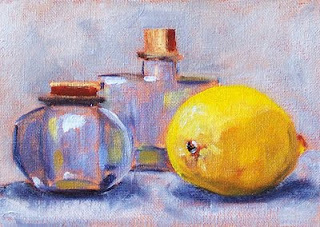 It has joined some of my other little still life paintings of fresh fruit at the Small Impressions Gallery. To view it in the gallery or purchase, click here. The day before Easter, my lovely sister-in-law visited the Skagit Valley Tulip Festival. She returned home with boquets of tulips for everyone, including me. They were so beautiful, I couldn't wait to get home from our Easter dinner and paint them. 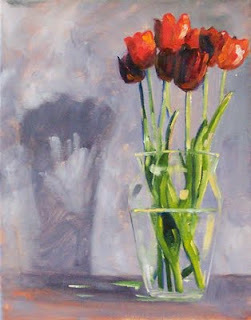 The painting is 11x14 inches and is painted in oil. It can be purchased online by clicking here. 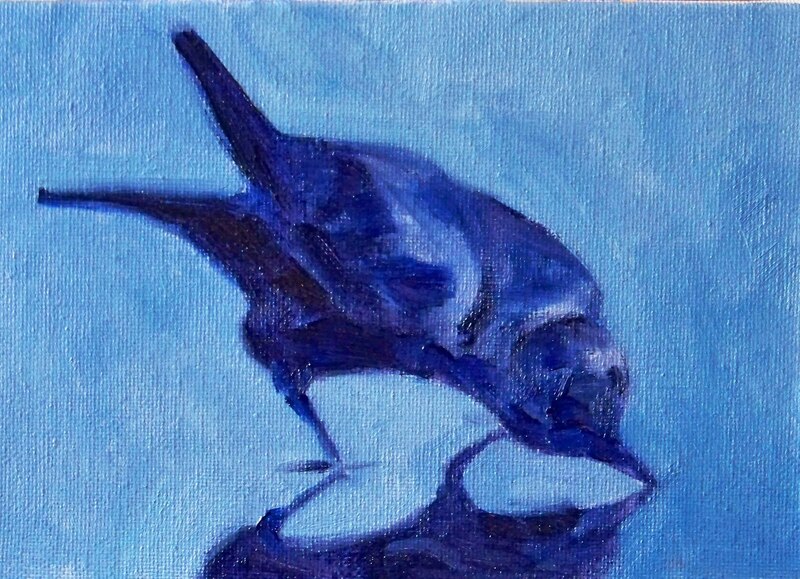 Today's painting is 6x6 inches, oil on canvas panel. 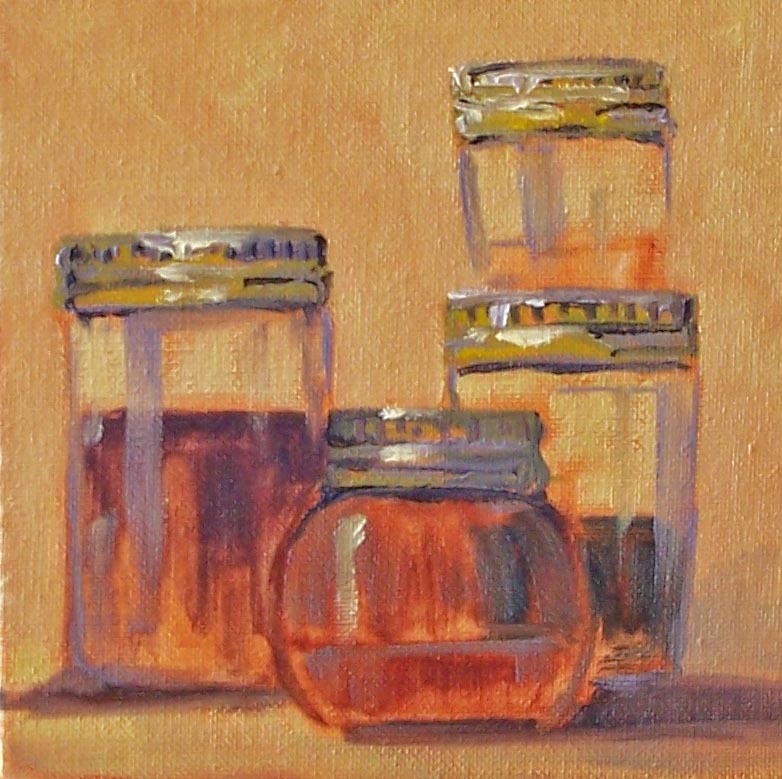 The subject is a collection of jars that sit in my studio. A couple of them have terpentine that I use for washes, another has mineral spirits that I use for cleaning brushes, and the smallest is a terpentine jar I take along when painting outside. It was fun to stack them up and paint. The varied shapes, colorful contents, and sparkle on the metal lids inspired me. It was a fun little challenge. This morning before the day developed into a typical too-busy Saturday, I was able to steal some time and paint this little 5x7 inch oil painting. Capturing glass is always a sweet challenge. Fiesta dinnerware has been around for years; I love the bright colors and have my own set of red Fiesta dinnerware. Many times I've attempted painting the red ceramics, but red is a challenge. It is such a potent color that it is often hard to mix three shades that allow an object to turn a corner. Adding white turns lovely red into a pink that is not the right color. I tweaked around enough with this one that I was finally satisfied. The painting is 6x6 inches on a canvas panel. 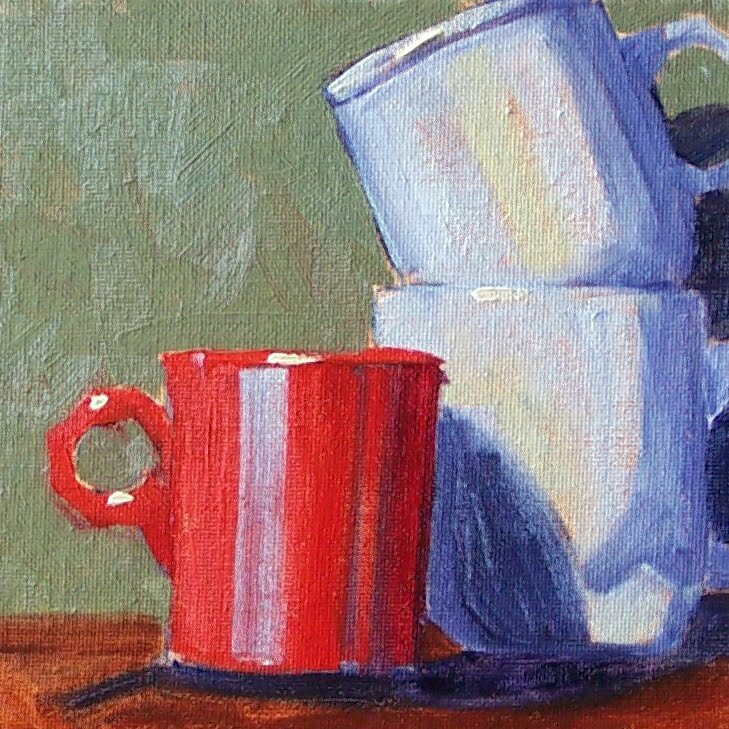 I used two hues of red, ultramarine blue, and a little white to create the reflecting light on that illusive red cup. This afternoon I had some fun painting a little sunshine. 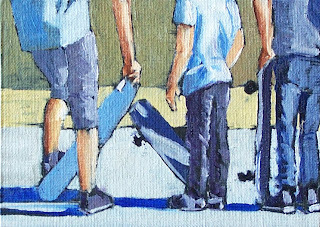 Boys with skateboards are appearing everywhere with their scrawny legs and endless energy. This 5x7 inch painting is a reminder that summer is coming and an inspiration for getting out with my camera and snapping some references for more painting. This painting is 5x7 inches on a canvas panel. I applied black gesso before beginning and took the time to draw the figures with a white chalk pencil before I begin painting. I hope you enjoy looking; I'm headed to the park! My father spent a portion of his life as a commercial fisherman. I have memories of spending hours out on the boat with him during the summer. 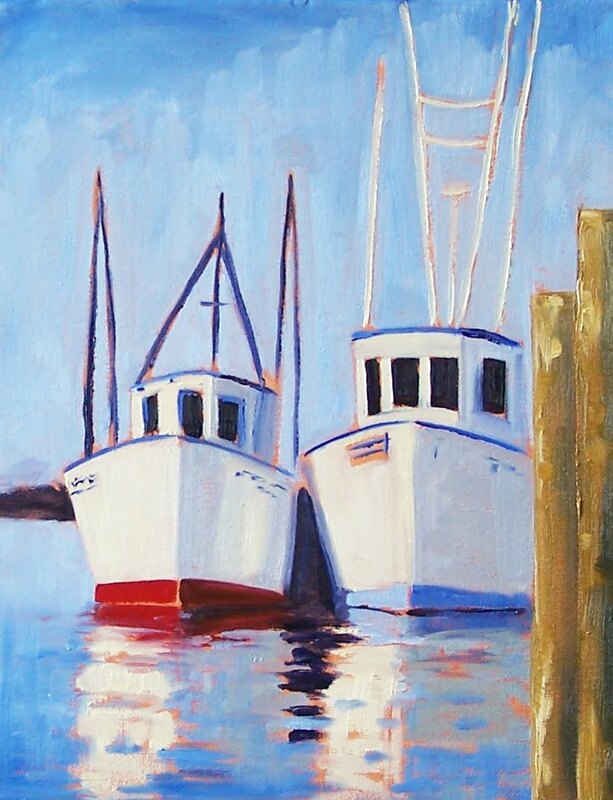 It is those memories that draw me to paint fishing boats from time to time. 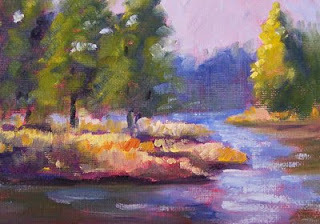 When painting this 11x14 inch oil painting, I had in mind the brilliant light of a sunny summer morning. Fresh air and sunshine feel so good. I almost forgot to post the last of this little crow/raven series. It was a joy to paint these creatures. Spending moments looking out may window provided plenty of references for creating paintings of some of their antics. This one is 5x7 inches on a canvas panel. 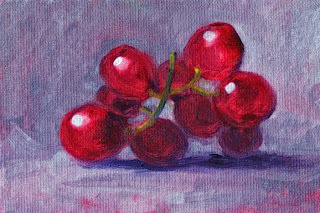 Today's painting is a fun little 4x6 inch oil on a canvas panel. 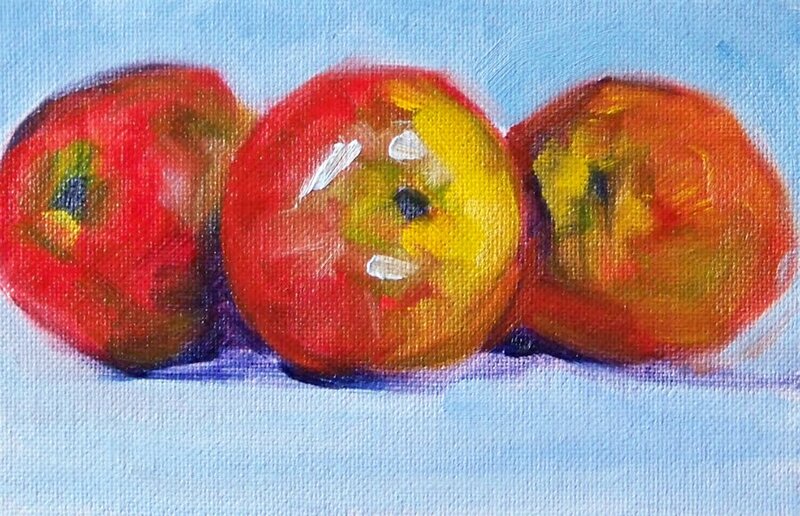 This trio of red apples caught my eye and it was fun to use loose brush strokes while creating the image. 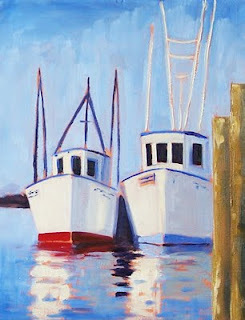 The painting can be purchased for $30.00 plus shipping at the online gallery, Small Impressions. I imagine it gracing a little corner in someone's kitchen. It has been a week since my last post because of an incredible opportunity I couldn't pass up. This past week I was invited to spend my time in Bend, Oregon. Even though I've spent my entire life in the Pacific Northwest, Bend was one place I had never visit. It was absolutely lovely! As soon as I drove over the pass into Central Oregon, the sun came out. After weeks of drenching rain, it felt like I was arriving at heaven's gate. Over the course of the week I was able to take two bike rides and hike almost every day. It was a challenge to fit in any painting time, but the above 5x7 inch painting did emerge as a result of hiking along the Dechutes River Trail late one afternoon. I'm looking forward to transferring more of my memories to canvas. This painting can be purchased for $40.00 plus shipping at the online gallery, Small Impressions. Just click here. 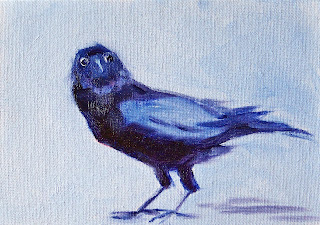 Here is another of my recent crow paintings. This guy looked like he was questioning my presence and hoping I would head the other direction. The painting is 5x7 inches and can be purchased here for $40.00 plus shipping.